Barrel: 416R Stainless steel. Chambered in 223 Wylde, with a 1:7 twist, M4 barrel extension, and a rifle-length gas system. Barrel is is finished off with a PSA 15" Lightweight M-Lok free float rail, .750 gas block, and A2 flash hider. Bolt: Full-auto profile bolt carrier group. Milspec Carpenter No. 158® steel bolt, Shot Peened, Gas Key Hardened to USGI Specifications, Fastened with Grade 8 screws, and Staked Per Mil-Spec. 8620 steel M-16 profile carrier is chrome lined and phosphate coated. Is this the Premium bcg? BEST ANSWER: Yes, I believe that most people here will do all the leg-work for you. What is the correct buffer and spring for this upper assembly? BEST ANSWER: Yes I am curious as well. Uses rifle length gas system so I'd assume rifle buffer would be ideal. However, this is basically a Mk12SPR upper, and I believe (Don't hold me to that..) they used both A2 stocks/buffers as well as CAR stocks/buffers, so will both work? Will one work better? will this upper fire both .223 and 5.56 ammo? BEST ANSWER: Yes. Fired about 100 rounds of federal xm193 through mine, and the other 200 or so rounds have been .223 Rem of different types. Both have worked well in this upper in my experience. Yes, 223 Wylde with chamber and fire both calibers. Yes. If it says Wylde then it is chambered to fire both. Yes it will. It will make a very accurate rifle. Simple answer. Yes. No worries. 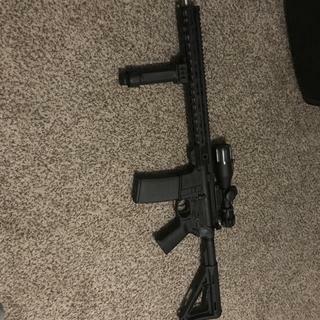 does this upper have everything you need to build it or will I need to but a parts kit? BEST ANSWER: Upper assembly is complete. All you need is a lower assembly to attach it to and a sighting system. This is a complete upper assembly. No additional parts required. Will this work with SKU: 7779347? BEST ANSWER: Yes, it will work with the upper that you have designated. Do I have to purchase the front and rear pins that hold the upper and lower together? Or are the pins included with either the upper or lower assembly? BEST ANSWER: The pins should be part of a complete lower. If you are buying everything separate ie stripped lower, then yes you will need to buy pins to complete the lower. The pins come with a complete lower assembly. The upper does not come with pins. If you are building your own lower, the lower build kits come with pins. Good luck with your new rifle! The pins are not included in the upper assembly. If you buy a complete lower they should already be installed. If you buy a stripped lower, then they come in a lower parts kit. Takedown pins are a part of the Lower Build kit. They are installed in the lower assembly. is this a free floating barrel? BEST ANSWER: Don, that is indeed a free floating barrel. Is this classified as a pencil barrel? BEST ANSWER: No, the lightweight part is the lightweight handguard. Description even says "Barrel Profile: A2 Style" and .750 gas block. And what do I need to mount a grip on the front? BEST ANSWER: Yes this will work with that lower no problem. I added a foregrip but it is not needed. Depends your grip, how you shoot. foregrips are great for control, try a few and see which one works well with your grip. 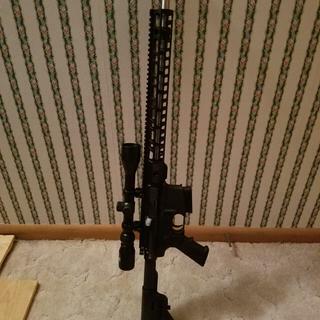 I love this upper its on my long range AR and is shooting 1" groups all day long. I would assume it works with that lower. I paired mine to a spikes lower and it fit great. As far as the grip. You will just need the type rail your grip mounts to and mount to your MOE. I used a Magpul angled fore grip and picatinny rail. It will work just fine with it and you will need m lol picatinny railing to mount it to bottom or an m lol grip for the from. Will this fit the psa ar15 complete blackhawk classic lower? is this lower compatible with the .223 wylde on your site? BEST ANSWER: No--the 18" rifle length .223 wylde requires a RIFLE length buffer tube. The lower pictured is a CARBINE length buffer tube. I'd assume rifle length buffer as it uses rifle length gas system, however one can find pics all over of 18" barreled uppers on carbine buffer lowers, plus I believe some Mk12's used car stocks; will carbine buffer work, and just require different weight buffer? im confused someone commented no? So will this work? Yes. I have used this upper with an MOE carbine lower. Works very nice, actually. I'd this a fn made barrel? BEST ANSWER: I don’t believe so. How does 55 gr 223 or 5.56 perform in this 1/7 twist barrel? BEST ANSWER: It still stabalizes them pretty good. Been shooting 400 yds ar clays and it does just fine. I have not fired the rifle at a range. So, I can’t give a good answer. What's the accuracy on this barrel? What typical MOA will this shoot with 55 or 62 grain rounds? Because that's about as good as those rounds will shoot through most anything. With this upper I have shot 5 shot sub moa groups with Hornady 53gr superformance varmint. The federal predator/varmint 50 gr hollowpoint also shoots sub moa. Thanks Cody. I figured with cheaper ammo you'd only get about 2 MOA. Bought this for my kid this past Christmas and just slapped a Leupold Mark AR 1 MOD 1.5-4 Scope on it. He's pretty excited to go shooting this weekend. Will this be shipped to california? I have fixed mag so i can use flash hider, but some sites dont care. BEST ANSWER: Yes. There's currently no restrictions for any AR parts to CA to include lower receivers. Lowers have to be shipped to a FFL while everything else goes straight to your home. Will the Magpul Industries Sling Attachment, M-LOK, Quick Detach MAG606 fit the handguard? BEST ANSWER: Yes, it will fit because it is compatible with the M-Lok upper rail. I see no reason why it would not fit. I received this upper for Christmas. What a great surprise! I have a Ruger AR 556 chambered in .556. Fit great with no issues. Have not fired it yet. Will this upper cycle properly with my original Ruger AR 556 buffer and spring? BEST ANSWER: I bet it did. Who’s the barrel manufacturer of this uppers barrel? BEST ANSWER: Most likely PSA. Google search "PSA Our Story" and watch the video. PSA now makes most AR components. Will this upper ship to my home in Texas? thank you in advance. BEST ANSWER: Yes. There are no laws regulating the sale of uppers or AR-15 parts in Texas. Is the barrel rifling polygonal? Which or any recommendations PSA complete lower that will match and fit with this upper please? BEST ANSWER: This upper will drop onto pretty much any of PSA's (or really any Mil Spec) lowers and function fine. Pick the lower with the furniture you prefer and go with it. Which buffer system is preferred? Carbine or rifle? I'd assume rifle, though I'm sure carbine can be made to work with proper weight buffer? Will this fit a lefty lower from stag arms? What is M 16 profile carrier is chromed lined ? What is the barrel's gas port diameter (and tolerance) on PSA SS 18" rifle length gas system? I purchased this upper in August of 2018 and just recently got to try it out. Accuracy was amazing with 855 5.56 55 gr but would not cycle steel cased or federal 223 brass. I contacted PSA customer service and with no hassle at all sent a returne label to me. I got my upper back within two weeks and just tried it and flawless performance. I would recommend this upper if you are looking for that bit more of accuracy. I am very happy and pleased with it and extremely happy with PSA quick and very friendly customer service. I put this on a PSA lower with the enhanced LPK. Fit and finish is great. Fired four rounds to make sure everything worked, spent cases landed in the same spot and no jams. Too cold to do any bench work so I will post that later. I put this upper on a Ruger lower and it fit perfect. With a Bushnell scope shoots 55 gr bullets into a inch or better at 100 yards. Good quality would buy again. Everything was straight, tight, and functioned flawlessly. The upper is exactly what I needed when I bought it. It's sitting on an SCR lower and wearing a Vortex 6-18x scope, and I use it for predator hunting, mostly on things lie bobcats and coyotes. It works fantastically for that purpose. I was pleasantly surprised by the handguard, it being much lighter than I normally see from PSA. Part looks great, does not function correctly. I have tried a couple different buffers, and the rifle seems to short stroke. I had to realign the gas block, but that still hasn't fixed the problem. Next step will be to cut off a few of the coils from the buffer spring. The ejection pattern of the shells looks good, just don't think the bolt is coming back far enough. Might also have to continue to break in the rifle. The bolt and rifle hve been cleaned after each outing. Like all of my PSA goodies, this one rocks! Fit and finish are great. Anyone looking to buy this should take the plunge, I definitely recommend it. The only thing I did was switched the flash hider to a SS flavor. Thanks again Palmetto! Very accurate and fits perfectly. I will add a lower picatinny rail, but I knew it did not come with that. Love the ease of order, price, options, and fit/finish of guns. I'm not a gun aficionado by any means, but every piece I have ordered has been well made and accurate. Thanks PSA for good quality with the price! More Accurate Every Time Out! This is a very well made upper assembly, the fit and finish is first class and it looks great. Installed it on a DPMS lower w/o issue. Have a total of 260 .223 and 5.56 rounds through it. The only ammo that wouldn't pickup the next round in the magazine was some cheap Win 556 55gr FMJ. It seemed to short stroke which I believe maybe due it being a rifle length gas system. Accuracy has improved incredibly after a long 'shoot and clean' 100 rd break in. However, the things really started looking up once I had the first 200 rounds down the barrel. It's shooting just over 1 moa at 200 and 300yrds! Overall, I couldn't be more pleased with the quality and value PSA has put into this upper. I would buy again and recommend this upper to a friend. This defiantly gets 5 stars in my book. Was delivered in a gift box, I was surprised. This is AWESOME , very clean, zeroed right in with Ohuhu scope at 100 yards . Fit perfectly to my lower.Super FAST delivery! I really like this upper. 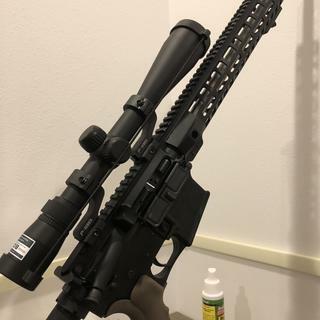 I set it up with a 3x9x44 optic. The rifle length gas system is so soft and has been 100% reliable with less than average quality ammo. Only issue i had was that the screws on hand guard were loose. I tightened them down and they have held up perfect. Fit was good and it shoots relatively well for an AR. I'm not getting 1 MOA out of it, but I didnt expect to at this price point and an AR. Shipping was fast, upper and lower looked perfect. Only did a barrel break in with 55g Fiocchi fmj and after zero had a 5 shot group 1”. PA10 upper I bought, same thing. I bought this upper and put it on my S&W sport lower. Fit nice and shoots good. It seems to like brass casings better than the steel. Seems to have trouble picking up the next round with steel casings. Would buy again in the future. I have submitted a photo of what this upper is capable of. It’s on palmetto state armories Facebook page. I couldn’t be more pleased and my friends more jealous. 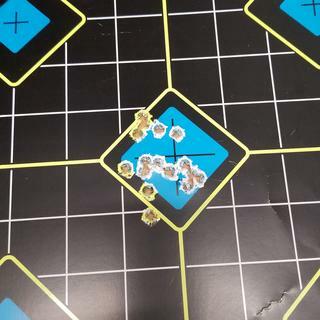 Awesome, after 250 rnds no problems, tight groups! Can't go wrong with this one! So far so good! About 200 rounds through the upper on my bushmaster lower. Shooting sub-moa with federal gold medal 69gr .223 and Hornady super performance match 75gr 5.56. Hahahaha !!! Me laughing all the way to the bank. First rifle I’ve ever bought and I couldn’t be happier. Dollar for Dollar best Ar I have found. I bought this upper with one of PSA’s MOE lowers and they fit together like a bank vault! The bolt action is smooth. 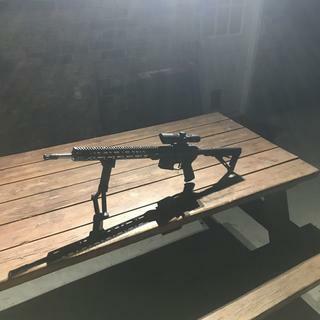 I have a couple AR’s that I paid 5 times more for and so far the only thing I can say is that they have nicer rails (although I have no complaints about the PSA rail) and the PSA upper and Lower fit together tighter with absolutely zero play. I may have gotten lucky but that is my experience. I haven’t grouped the rifle yet to comment on accuracy but as far as reliability it has been flawless. I do have a buddy that has one with the keymod rail and he is getting sub moa with handloads. I’ve had it to the range to sight in the scope. Just a cheap $100.00 scope but it shoots better than I do so I’m happy with it. Very pleased. Accurate and consistent, weight is light and everything worked great putting this on my Bushmaster lower. The barrel married up great to the PSA upper. The groups are not as good as the photo you see on these review. Granted, we've only got 200 rounds through it so far. I'm sure with cleaning up the barrel and smoothing out any chatter marks. I'll get it running better. Fit and finish are great. I was looking for just a barrel for a build and ran across this. This entire assembly was almost the same cost as a barrel alone so I bought it instead. Really nice. Would buy again. Excellent quality, will be back for more. This is my 10th order. No problems ever. Great products. It looked great but the accuracy was terrible. We do apologize for that. We guarantee our barrels to have a max of 3MOA. Please contact Customer Service so we may resolve this issue. I originally got a build from some guy at a gun show and let me tell you it was horrible. It was my first AR and I was ready to throw the whole deal out the window. Short stroking, buffer spring coming out inside the gun while shooting, stovepipes, etc. etc. and all that after about 60 rounds. Well I went to the gun shop to sell the thing but they wouldn't take it. In desperation, I ordered this upper as a last resort. I should have done this right off. The rifle now shoots very well, it's accurate and dependable. Also LIGHTER!!!! I would tell you if you want a good upper, get this one and don't look back! VERY accurate plus works like it should with carbine lower. I have three 18" PSA uppers, 2 mid and this rifle length. ALL have been very high quality ! This rifle length Wylde chamber upper is incredibly accurate ! I am talking 3/8" when bagged and ammuniton it likes. All but no copper fowling nor has there been in any of my PSA 18" uppers. As I understand it, PSA does their own barrels in house and if so...they are really turning out some fine barrels ! Either the mid length or the rifle length 18" Wilde chamber uppers are superb...they really are...thank you Palmetto . This is the first AR upper I have purchased from PSA and have to say I'm truly IMPRESSED with the quality and accuracy of this upper. I have a Lyman Bore Scope and scope every barrel I buy and the quality of this barrel is exceptional. 30 round group at 100 yards WITH gusty winds, no less. My first AR, so I don't have a lot to compare it to. Popped this on a fresh lower kit and fired a box of 223 without issue. That's as far as I got with this, but so far I'm very pleased. This is my first AR15 build. 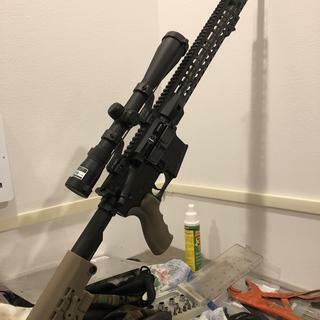 I think this is a great upper for the price, haven't had any issues with it so far. I would recommend this product. Fit fine, functions perfectly improved my groups, Now thinking about getting an AR10 lower and upper. Outstanding service, fair prices, good quality. This is my favorite rifle by far. Accurate and stable follow up shots that cut holes. The biggest reason I gave it 5 stars is 6 wasn’t an option. You don’t expect this kind of quality for the price asked. Very happy with it. Just received my upper today, the fit and finish on this piece is outstanding. Well balanced lightweight, after handling my piston upper it was a pleasant surprise. I wanted at least one upper you didn’t mind carrying and this one is it. The nickel boron bolt group is highly polished, should be a breeze to keep clean. Can’t wait to get out on the range with it.